It all began in the mid-50’s when my dad got his first 544 from his father’s Volvo Dealership. That sparked my dad’s interest which in turn got me started when I first helped him combine 2 164’s into my mom’s daily driver when I was 8. Dad had a 122 at that time, which got sold and later replaced with a 73 144. After seeing that, I kinda liked it so I decided that was something I wouldn’t mind driving when I got my license. Well that car got sold before I realized I like it, but when I was 15 (in 1994)I started looking for something to fix up for when I got my license in a couple years. After 6 months I finally found a 74 144 for $1200 that was actually a solid color (oxidized burgundy from Maaco except for the trunk lid and rear valence panel that were the original red), had current non-operational status, and actually ran almost decent. After looking at it, the price dropped to $800, so when dad went up with me to drive it (since I didn’t have a license) it needed work, but the price dropped to $430 (the owner’s monthly rent) so it came home with us. So begins the tale of the ongoing project car. First things first involved getting the thing to run under it’s own power reliably. The previous owner paid for a new fuel pump which never got installed, the transmission was worn out in first through third, the seat belt and window crank on the driver-side were shot, lights didn’t work right, the left rear caliper was dragging and the pad had worn into the rotor beyond repair, and of course the normal tune-up stuff. I also came across a set of 240 Turbo wheels so the car got a little dignity instead of the narrow stock wheels. At this point it ran well enough to run on the road occasionally to keep it in decent shape while working on other projects, after rebuilding all the calipers and watching as the chunky brake fluid was bled from the lines. From that point, any jobs I could get I’d take to get money to put this or that on whether it be cosmetic or mechanical. Over the next 3 years it had the engine rebuilt (twice due to bad parts the first time) and bored to 2130cc with an IPD Street Torque cam and header, IPD sway bars, stock bushings, new shocks, a conversion to an M41 transmission, an aftermarket ignition, and a few little things like an uncracked windshield, working headlights, and all the stuff to make it legal. Finally it came time to get it on the road and smog-checked. Passed on the third try about 5% under the maximum limit because of the cam, but it passed and was registered, and I now had my license! Now that I had a car and my license, I finally got a full-time job but was still living at home so any money that didn’t go to gas went to the car. With the daily-driver status now, it had to be weekend projects if it was big as this was my only transportation. When summer arrived, it saw a lot of use in what some might consider a rally-type use while driving the 3 miles into a summer camp along dirt roads. After my first two minor accidents on the road that weren’t my fault, I slowed down a little, but I was still impressed that after hitting a Dodge Caravan and only getting a broken turn signal lens and being hit be an Expedition and only having $120 in repairs from junkyard parts, the car held up really well to my abuse. Summer ended so it was back to work and working on the car. Next up was the B20 electronic distributor, MSD ignition and surface-gap plugs from dad’s outboard boat engine that seemed to work wonders on the car, a new fuel tank and new (not from the junkyard) fuel pump, cleaned radiator, new water pump, and seats from a 240. I thought at this point, ‘now this is really a fun car, and if I do this it’ll be nicer, but I can do that at the same time and it’ll be even better!’. That seems to get me in trouble, but any time something needs replacing, it almost NEVER goes stock but rather an aftermarket or modified part of some kind. After buying the parts, I took it to the shop who was going to do the work since I didn’t have the experience or tools to do it. I walked in carrying the parts, left the parts in the shop, and get a call the next day with the wonderful news that the car was broken into overnight and the destroyed the trunk, dash, passenger door and took a few things. I will say that sets a horrible feeling in the stomach when you hear that about your baby that spent it’s first night out of your care at a shop only to have that happen. They finally got the parts installed since they were taken into the shop and didn’t get stolen, and after a fight, I ended up fixing that shop’s mistakes as well, but still had to deal with my insurance trying to total the car based on the damage. Fortunately I had kept all my receipts so after showing them to the adjuster, they allowed me to keep the clean title and get the car fixed. The money from the insurance went to getting the entire car sandblasted, the new door and trunk installed, the dings filled in, and the car painted in the original color with a base-coat/clear-coat paint job. I did all the parts removal and had everything sitting in the garage for 6 weeks while the car was being painted, but when it came back home it looked simply incredible! I got everything put back on including a set of tinted windows I got from the local recycler as well as new late-model 240 door panels and matching seats, new 240 door trim, and a couple emblems that were missing. It looked amazing but now I was afraid to drive it in fear of scratching, but had to since I was otherwise stuck driving my truck at 10 miles per gallon. When I first pulled into work with the ‘new’ car everyone was amazed, and after 15 months I still get people asking me what year it is, telling me they had one just like it, or just complimenting me on such a nice car. Seeing what it looked like at this point, I decided to enter it in the VCOA meet in Davis, California in May 2003, only to end up taking the Best in Class for the 120/140/160 series! That was a huge shock as there were some really clean cars there, but it has it’s first ‘trophy’. Since then it has also received an R-Sport instrument cluster and an Air/Fuel gauge to aid in my constant tuning, plus a modified air intake without the airbox but a K&N instead, a polished intake manifold, and was recently run at the local track which turned up a 18.22 @ 73.6 with a slipping clutch and myself having no experience running at the track as well. I’m sure there’s a lot more history of the car I’ve overlooked, but it’s been an adventure regardless. I recently had it appraised as well which came up with an amount that was only about $5000 less that what I have in the car, so it’s now insured to that amount so that nobody will be able to take my car from me! I’ve told a few people that the only way I’ll be getting rid of this car is if I either die in it or it’s damaged beyond recognition. Am I obsessed with it? I don’t think so, just very much in love with a wonderful Swedish piece of art. In fall 2005 I happened to be looking around on craigslist during my lunch break at work and found a 90 745 Turbo listed up for really cheap, which already had some nice add-on's from IPD, but it was listed as parts, not running. Figuring I could easily make a few bucks parting it out, I went to look at it and inked a deal to come back the next day with a trailer and remainder of the cash. When I finally got it home I found the not running issue was seriously misdiagnosed by the shop he had look at it, so what he was told was a $2200 head gasket job ended up being a $5 valve spring and a half hour of labor. From there it was up and running, so with a little minor maintenance I started driving it...and fell in love with it. It then became my commuter so the 140 can stay safe at home, away from the parking lot wars, and I made the mistake of saying to quite a few people that 'this one will stay completely stock'. To this day those words haunt me. This was my first turbo car, so of course the research began, which immediately meant a 3" exhaust, which of course needed a bigger turbo. Then came the better cam, which of course needed a fully built motor to be installed into (forged internals, fully balanced, ported big valved head), which of course needed a bigger yet turbo (2 different options I've been thru there, between a Dodge Cummins truck turbo to the current ball bearing Garrett). Those of course lead to a suspension rebuild with poly bushings, a lower chassis brace, and of course the need for bigger brakes. Found a deal on some used Wilwood calipers, but didn't want to go that route for the rotor hats, so I came up with a design to use factory S60R rotors. After that design a friend from the Turbobricks community loved the idea and made some for his insane project, which others have decided to purchase from him as well. Over the last 10 years my wagon has brought me so much joy, even for a wagon. I swore when I was young I would never own one, now I could never not own one. It hauls things on a regular basis, and it hauls when I need it to. I've been out to the local 1/4 mile racetrack countless times over the last 5 years and always get the sneers and snickers from the crowd, until my second pass. After they see those times (current best is 13.5 at 105mph, with far better to be had down the road), then they come over and ask what this car has done to it, since it looks nearly stock under the hood. 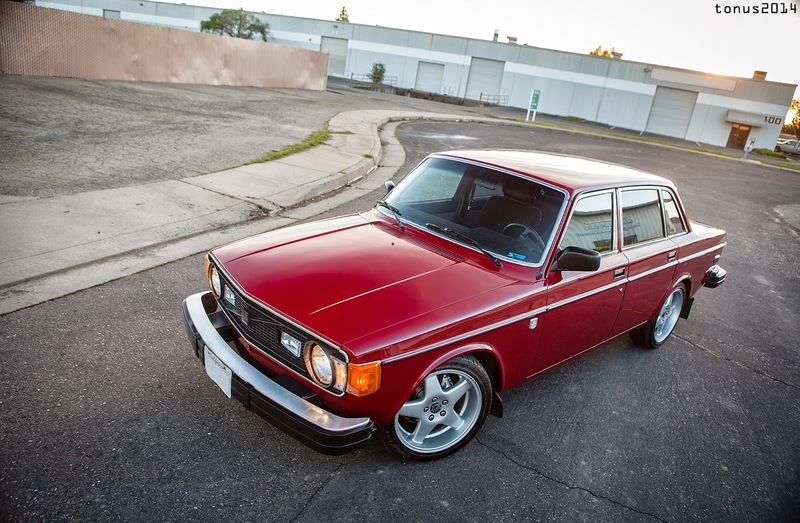 Last but not least, the Volvo community actually lead me to meet my wife. Thru mutual friends, I organized a caravan to a local meet, and ended up chatting with my wife to be. I was gimped up with a broken leg from skiing while in the process of installing insulation, sheetrock, and repaint my living room so she came over to give me a hand with that and it was just meant to be. It also didn't hurt that she was driving a red 850R wagon, with her first car being a black 242 Turbo. After a few wonderful years she became my wife, and occasionally she even ventures along with me to a few of the events. As for her car, I've been tasked with leaving it mostly stock. She purchased it with modified suspension and an exhaust, but it has only received maintenance since then, along with a few 'while I'm in there' modifications. After putting on over 160k on the 850R, we finally sold it at 296k, to a longtime friend and Volvo aficionado, but all is not lost. It's replacement is a baby, an 09 V50T5 AWD R-Design with just an almost broken in 83k. Let's see if that one can hit 300k! That's the very abridged version. 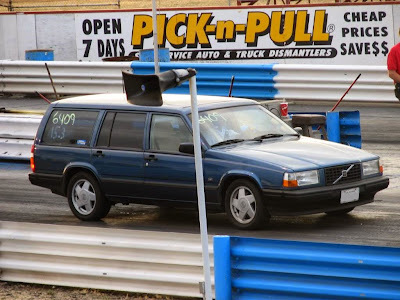 In case you didn't read all of that, a cliffs notes version...Hi, my name is Gary, and I'm a Volvo addict. Gary wins his category at Davis 2010! Gary wins his category at Davis 2012! Gary wins his category at Davis 2013! Gary wins his category at Davis 2014!